Having emerged from last year’s 6th single election as battle-hardened veterans, JKT48 fans returned in full force for this year’s 10th single election. Many fans welcomed last year’s results with enthusiasm, and also a great deal of satisfaction, but I also considered those results as “safe”. The 10th single election tested the endurance of fans. While it may not be said out loud, I believe it has been a draining month for fans. This year’s election ran for five weeks—exactly 35 days—which is two weeks shorter than last year. The short span of this period forced JKT48 fans to become more competitive in the efforts to push for their oshimen. We will break down each phase in order to digest what happened under the surface. The graphic above displays the result of the first phase of the election that was announced on April 7. This reflects the total number of votes submitted in the first week of election, which ran from the release of “Pareo adalah Emerald” on March 27 to the seventh day on April 2. In this period, a total of 23,104 votes were received for the top 16 members and 32,989 for the top 32 members. This year, JKT48 management abandoned the idea of selling pre-election singles through channel distribution at convenience stores. In centralizing all sales, the guerrilla warfare for pre-election singles that was so rampant last year was no longer a factor in the second election. What does this mean? Immediate availability of voting serial codes, made available in the 9th single, allowed for a quicker pace of voting in the first phase of the election. By allowing fans to pre-order and pre-pay for their purchases electronically, JKT48 management were able to hand out voting codes quicker and more efficiently even before the fans could hold physical copies of the singles they bought. When excluding possible votes submitted by theater attendees and Official Fan Club members, we can estimate that at least 8,000 equivalent copies of the theater version of the 9th single were sold in the first week. This is more than five times the number sold within the same time frame last year, which is a testament to the increased efficiency of this year’s election. Without a guerrilla warfare, the results of the first phase relied solely on a single factor. Which members have fans who could accumulate funds the fastest to gain an early lead in CD purchases and serial code acquisition? This benefits the more tightly-knit fan circles, such as those of Sisil, Sendy, and third generation members. They may have prepared days or weeks before the actual voting period began in accumulating these funds. On the other hand, members with much larger fan communities, such as those of Team J, would take longer to organize a plan of attack while still putting a respectable show of force just because individual members of their communities know how to act independently. The graphic above displays the result of the second phase of the election that was announced on April 14. This reflects the total number of votes submitted through the second week. This phase overlapped the period in which management allowed votes to be submitted using serial numbers acquired from mobile content downloads by text message, a program that ran April 8–12. The second phase is where the election turned into a complex game of numbers. During the second phase alone, the tally had accumulated more than 100,000 additional votes, quadrupling the total number of votes from the first phase. This is an incredible feat, considering that not all of the mobile content votes should have been counted. The graphic to the right ranks members according to the number of votes gained during the second phase alone. Two members—Jeje and Shani—entered the rankings only in this phase, so their numbers reflect gains in both phases. Key shifts in the rankings occurred in upper bracket during this phase. When the dust settled, the seven largest gainers in this phase were now in the top seven positions of the rankings. At this point of the election, fans became more cost-conscious. JKT48 management had made an unprecedented move in bundling the election voting tickets in the theater versions of the 9th single, which is normally reserved for handshake tickets. (Even AKB48 Sousenkyo tickets are only included in the regular version of the single, not the theater version.) It was also discovered that the cost of votes gained through mobile downloads had risen from the previous year. The loophole that was present in last year’s mobile download votes was also resolved. The regular version of the 9th single contains a photo card of one of the single’s senbatsu members. The theater version contains a handshake ticket and a trading card. The basic version contains a sticker. Mobile content download contains no bonuses. Fans immediately caught on to the idea of reselling bonuses included in the 9th single. Of the available bonuses, handshake tickets were considered to have the highest resale value. (Resale value of photo cards, trading cards, and stickers fluctuates according to the member, and the market for such items is limited to avid collectors.) By reselling handshake tickets at high as Rp. 25,000 each, fans could recoup between one-half to two-thirds of the cost of the single. In turn, those funds can be invested into purchasing new theater versions of the single. At Rp. 5,000 to Rp. 6,667 per vote, this proved to be a more cost-effective gamble than mobile content downloads. This gave rise to the frequent advertisements of “subsidized handshake tickets” for sale by each member’s fan bases. The faster handshake tickets are sold, the faster votes can be funneled to the members. The risk of this method is that the demand for a member’s handshake tickets cannot be anticipated, but it is a fact that fans would be enticed by handshake tickets at discounted prices. One inherent disadvantage of this system is with members who have very few handshake sessions, as fans would need to purchase tickets of other members in order to catch up. But in order to do so, fans of one member would need to collaborate with fans of another member to ensure handshake tickets can be resold with funds channeled to the subsidizing party. Followers of my or JKT48Stuff’s Twitter account may have seen a version of the table above on Friday and Saturday, where I predicted the triumph of Jessica Veranda over Melody Nurramdhani. What is the basis of this prediction? Last year, I observed that the vote gain in the final phase of the 6th single election was higher for Veranda than for Melody. 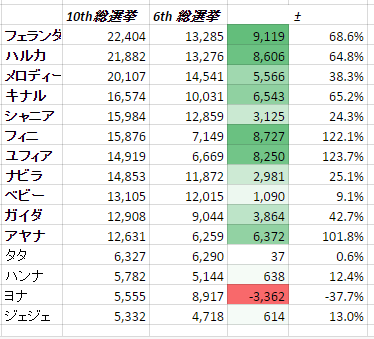 (Conversely, the ratio of votes through the second phase is higher for Melody than for Veranda.) This meant that the majority of Veranda’s votes came in the final phase of the election. I predicted this would happen again in the 10th single election, which it did. Veranda’s final phase vote gain outpaced that of Melody’s this year by a 37-point margin, securing her victory. Yet no one expected Melody to place third. Ruling out any foul play, fans of Haruka secured her second-place ranking in a last-minute sprint. Her vote gain for the final phase was 18,442, a tremendous 536-percent growth over her second phase results. This dwarfs even the second-largest vote gainer of the final phase, Andela, who gained 13,215 votes and rose 301 percent. Four other members gained more than 10,000 votes in the final phase—Veranda, Viny, Yuvia, and Ikha. In terms of percentage growth, Yuvia (336 percent), Beby (316 percent), and Ayana (315 percent) also stood out above the rest. As mentioned above, the number of handshake sessions available for a member likely had an effect on the number of votes she received. Andela is a prime example of this scenario. She started the month with only four sessions but successively sold out her sessions one by one until she sold out seven, equal to both Veranda and Melody and even more than Haruka. Yet a member’s own handshake session is not enough. Consider the fact that Shania and Viny sold just as many sessions as Veranda, Melody, and Andela, yet both place a distant sixth and seventh, respectively. Vote pacing is an important factor to consider when reviewing the final results. In a five-week election, steady pacing means 20 percent of a member’s vote should be submitted every week. With the final phase of the election being three weeks long, fans must aim for 60 percent of their member’s vote to be submitted during this period. However, this was not always be possible because fan groups might not have enough funds to execute their campaign strategies in the early stages. Instead, the ideal scenario is for a member’s votes to accelerate each week, growing at a faster pace from the previous week. Of the top 32 members, 14 received more than 60 percent of their votes in the final phase. Ten of these became senbatsu members. Although there were a number of surprising movements within the top 32 between the second and third phases, it is interesting to observe that no one was able to newly breach the top rankings. All 32 members who ranked in the second phase also ranked in the final phase. Of the 15 remaining senbatsu members of the 6th single, 11 returned as senbatsu in the 10th single. Yet we cannot compare the 10th single results to the 6th single results on an empirical basis because votes for the 6th single could be inflated through cheap mobile content downloads. However, vote differences between this year and last year can indicate certain trends. Since the average cost per vote has risen from the previous year, no change in votes between the two years means that monetary support for a certain member rose at the same level as the rise in cost. In this respect, rise in funding by fans of Tata and Beby closely matched the rise in costs. Increase in funds among fans of Viny, Yuvia, and Ayana more than doubled the pace of rising costs. Meanwhile, funding by fans of Yona was the only one which fell far below the rising costs. Declines in the ranks of Shania, Nabilah, and Beby are perhaps the biggest disappointments in this respect. Many will argue that they are key support members of Team J and the first generation, but as some of the youngest from last year’s senbatsu batch they experience stiff competition from older members who have developed a stronger sense of mission. This is reflected well in how they reacted to their results. These results were certified by the notary office of Tjhong Sendrawan. While there is little publicly available information on the Internet regarding his background, he appears to have signed off on a number of transactions involving companies listed on the Indonesia Stock Exchange. Therefore, it is my judgment that the election results are valid and without error. Allegations of fraud can be seen as unwarranted defamation of the election process until concrete proof is brought forward. Perhaps the Cinderella story of this year’s election is that of Sisil, who was once left behind by JKT48 management as a Trainee before finally becoming among the last of the second generation to be promoted into a team. Following her placement into Team KIII, she has magnified her presence on and off the stage and allowed her personality to impress JKT48 fans. Admittedly, I was also among those who doubted Sisil’s determination in her early days as a Trainee, but she has grown tremendously in the two years since I first saw her. The 10th single election shows us that a strong start (such as Sisil’s) or a strong finish (such as Haruka’s) can play a critical role in securing a member’s place in the single’s line-up. I was initially worried about Ikha’s placement in the top rankings because she was the only member whose vote gain in the second phase (1,918) was lower than in the first phase (2,580). Clearly, fans of Ikha were able to defy expectations and endured a long battle. We have yet to fully understand what Melody’s fall means for JKT48 in the year ahead. On the one hand, it is an opportunity for JKT48 members to introduce younger members to the public. On the other hand, it challenges Indonesians’ image of JKT48 where Melody is its most recognizable face. Can Indonesians still recognize JKT48 with Jessica Veranda as its center? It’s not quite that simple. There were widespread reports of voting codes turning up as invalid or having “expired”, so it is best to check as soon as possible whether the codes were usable. Otherwise you run the risk of money being thrown away on invalid codes. Haruka’s fanbase’s last spurt strategy has successfully worked for two years in a row. In 2014 JKT48 1st Senbatsu Sousenkyo, Haruka’s 2nd preliminary result was 14th place (2,718 votes) and her final result was 3rd place (13,276). Please note that in 2014 JKT48 1st Senbatsu Sousenkyo period, there were also widespread reports of voting codes turning up as invalid or having “expired”. I’ve always enjoyed most of your pieces. Please try to limit your unnecessary incorrect facts. We don’t want the “Dentsu Indonesia is owned by Harry Tanoesoedibyo (Global Mediacom or MNC Media Group)” to repeat. As a fan of Yona, I’m really affected by the results. Granted, I’m a single fighter type, so I wouldn’t know nor care enough about all those voting strategies. But still… Anyway, I digress. Good round up, btw. Another interesting moment is probably the downfall of Yona, who received 3,362 votes less than last year. She’s the only one who receive this, while other members have bigger vote numbers. Hmm, I wonder why though? Is it because her popularity is fading? Or is it something that she has done in the past year that makes fans oshihen and vote for somebody else? Your guess is as good as mine. There’s no single satisfactory explanation concerning the matter, at least from what I gathered. I guess I’ll just have to accept the fact that I have failed her. But I’m not trying to speak on behalf of her other fans, though it must have been awful for them also. As fans of yona, I was disappointed with the drastic decline in number of votes in the election senbatsu this time by 37.7 % ( according to the data in the article above ) . Saw some videos on youtube , I saw yona often forget the dance routine, it was evident from the way he looked into other members first before making the next dance routine. A little input , maybe yona need to work harder in her dance skill. While I’m by no means a professional dancer, coreographer and/or jury, I still can see your point. Perhaps dancing (and memorizing the blocking routines, to some extent) is just not her forte. Though it does make her effort to still try to perform well, or at least on par with the others, as rather commendable. I hope these recent events could serve as a wake up call, both for Yona and her fans. for a non favorite member, Yona actually already made an achievement.. she always made it on every voting event (last year “election”, PD revival, calendar, and this year “election”)..
don’t worry about her, she will make it on the top 16 next year (if she still in JKT and there still be an “election” of course)..
Statistics. I’ve never had good time with it. Anyway, good job for writing this thesis, uh, I mean this article.